In junior high, finding myself wasn’t easy. In ninth grade, I started taking multiple math classes because I told my parents that I was bored in school. That didn’t have any of that. So, taking senior high classes took me out of lunch with my “friends” and into a senior high schedule. I felt like Super Nerd couldn’t find her place. My “best friends” weren’t my friends for a year or so and I went back and forth between friend groups. In tenth grade, I found myself when I realized that every group of friends is diverse and its members each hold a unique role such as the funny one, the helpful one, the party animal, the mom, the glue of the group and the list goes on and on. Perhaps the most underrated (but what I believe to be the best) role you can have in a group, or in life, is the low-key nerd. Low-key nerds aren’t geeks. These people may be “cool” but know deep down that the loser is within them… and they’re perfectly fine with that. Usually, they genuinely have their “you know what” together, and are kind of “cool,” but they probably have the highest IQ’s amongst their friends. Your friends are always wondering where half of what you say comes from. Your brain is like a sponge and you somehow remember random things that you learned throughout school. I mean who doesn’t know the first piano was the harpsichord? While everyone else is talking about how Jake didn’t answer a text or how Sam is being a “you know what” this week, you can just sit there, pretend to listen, and think about the new integration technique you just learned. You look like a good time, and you probably are, but for the most part, deep down you’re on a different level. You could be the girl that’s drunk, out at 3 am, dancing down Gardner Street carrying her heels, but still probably hold a conversation with someone sober about something normal. Whenever you walk in front of adults, you are always the first one to talk. Because you have effective communication skills and they all look up to you and trust you, you always speak for the group or explain for everyone. Since you are smart, odds are you probably played a musical instrument at some point in your life. Because you are constantly seeking new things to excite your brain, you probably have a wide array of music you’re into. You appreciate all types of music: Classical, Jazz, Rap… just maybe not Country. This is one main differences between high-key and low-key nerds. Despite wanting that person to like them, a really nerdy nerd will demean someone by correcting them. You usually know what you’re talking about and you don’t have to fake it. This is the best low-key nerd trait! Real nerds will make it known that they are intelligent, and wannabe scholars will try to make themselves look smart even though they just embarrass themselves. You on the other hand, can quietly relish in your intelligence without throwing it in everyone’s face. All in all, I believe that being a low-key nerd is awesome. I truly enjoyed our experience with the presentation of TED Talks in the One Button Studio of the Pattee Library. It was exciting to actually do what I have watched in so many other TED talks. Personally, I believe that my TED Talk went quite well. It was definitely a smooth performance. I established the shift in STEM in the American education system and went on to support my claim with evidence in a relaxed way. I feel as though I improved upon my minor errors from the practice session. Those previous errors included going over time and having too much information for a TED talk style presentation. I connected with the audience well, as it was appealing and they stayed focused on my presentation. They probably also stayed focused since they had a personal connection to STEM as that is the area in which their majors lie. Besides the connection, I think I had a nice and smooth flow to my overall presentation. I was happy and energetic about the topic area and that showed through the video. Additionally, my shift was clear, evident and in chronological order through my presentation. 2) What areas could be improved? I feel that I could have used a few less words on some of my slides. Also, on my chart about the PISA student performance, I could have made the middle line for the average score thicker. If that were thicker, it would have been easier on the eye for those people watching the presentation. In addition, another aesthetic area that could be improved were my color choices for my actual slides which accompanied my presentation. A better choice could have been white writing on a darker color slide such as black, navy blue or grey. Prompt: After reading chapter seven of the Rhetoric and Civic Life text, discuss how stasis theory might work to discover or to deepen the “framing questions” for your chosen controversy. My group includes Maddie, Matt and myself. Our topic area is the legacy of the late Joe Paterno. We plan to use stasis theory to deepen our framing questions in the investigation of our topic. By using the stases, one can find help in determining the argument at hand and its foundation. This can refer to the stance that someone agrees with. Also, it seems to be the point at which two individuals or parties agree to disagree. The stasis seems to be relatively easy to identify in our case. Side A would be that displaying Joe Paterno’s contributions to Penn State football and the University as a whole would be offensive. Side B would be the opinion that displaying his contributions would not be offensive. Would displaying his contributions effect or offend anyone? What is valued most, tradition and culture or the decisions made by the Penn State Board of Directors? Jurisdiction of Board vs. NCAA over Penn State? Is the line of separation the relation to football or is it just random decision making? Some examples of the line of separation include football related and non-football related pieces of his legacy that have come and gone. It is interesting that both sides of the argument continue the discussion about the current state of Joe Paterno’s legacy in Happy Valley. The point of stasis can clearly be identified. Americans have crafted a love-hate relationship with the public education system in which the majority of our future leaders learn, grow, and develop necessary skills. This relationship results from the faults that the system as a whole, continues to embody because of its original design. Indeed, the United States education system has only done what it was designed to do, over one hundred years ago when our country had different needs, in a different world economy. The American plan was to have well-rounded students to enter industry. Unfortunately, our students reached the potential of that system decades ago, and the bar for the traditional primary and secondary education was never raised. The start of the twenty first century brought a sea of concerns as televisions flashed images of Asian international students tremendously outperforming American students. President George W. Bush responded to the concerned call from numerous national education organizations in his 2006 State of the Union Address with a plan to refocus. Following the implementation of these initiatives, the United States watched a shift occur in the American education system toward a focus on STEM, which is short for science, technology, engineering and math, in order to increase competitiveness with the world at large. This speedy implementation can be attributed to the fear and worries of leaders in the U.S. government that believe the education system has been let go for too long. To some, the letters S T E & M are insignificant, but to many, their meaning is known and appreciated. STEM encompasses science, technology, energy and math. The acronym arose in common use shortly after a science education interagency meeting held at the National Science Foundation (NSF) and chaired by Rita Colwell, the previous NSF director. Scientists suggested a change from the older and uncommon acronym SMET to STEM. Dr. Colwell advocated for the NSF to institute the acronym change and it clearly stuck, as the development of STEM in education was speedy. In the early twentieth century, the American education system was driven by business leaders, such as Henry Rockefeller and Andrew Carnegie, who watched the United States in its transformation from an agricultural economy to an industrial one. There was a tremendous need for children to learn to read, write, and complete basic arithmetic in order to proficiently operate the country’s newest factories when they became adults. The industrial revolution created millions of jobs, while altering the American way of life and allowing the country to lead the global economy. The businessmen of the late 1800’s knew that a workforce with appropriate training and education was essential for success in business. They used America’s education system to satisfy the needs of the country. The education system evolved into its own small educating factory, as students moved from one class to another, each and every day. The system was dedicated to producing well-rounded students without any specific focuses. It was based solely on the basics of reading, writing, and arithmetic which failed to adequately prepare citizens to compete and be successful in the technological world of today. Unfortunately, not much about the factory-like educational structure has changed since the time of those business giants. STEM, as an acronym, was born out of worry about American competitiveness and maintaining a position of global leadership. In 2006, the United States National Academies expressed their concern about the declining state of STEM education in the United States. The Committee on Science, Engineering, and Public Policy developed a list of suggested actions. Its top three recommendations were to increase America’s talent pool by improving K–12 science and mathematics education, strengthen the skills of teachers through additional training in science, mathematics and technology, and enlarge the pipeline of students prepared to enter college and graduate with STEM degrees. President George W. Bush quickly got word of this national concern. In his 2006 State of the Union address, President Bush addressed his concern for and fear of an inability to compete against the international community. President Bush encouraged “innovation throughout our economy and to give our nation’s children a firm grounding in math and science.” He proposed that “if we ensure that America’s children succeed in life, they will ensure that America succeeds in the world” (McDermott). President Bush worried that there was a lack of high quality STEM research and education initiatives. Following his expression of concern, the President introduced the American Competitiveness Initiative to assist the advancement of our education system. STEM became a household name, in part, because of the efforts of President Bush and lawmakers to change the face of education. The American Competitiveness Initiative was driven by the belief that a student’s education is the gateway to opportunity and the foundation of a knowledge-based and innovation-driven economy. The goal of this $136 billion initiative was to increase investments in research and development, strengthen education, and encourage entrepreneurship and innovation. President Bush focused on tax credit for research and development. To prepare our citizens to compete more effectively in the global marketplace, the American Competitiveness Initiative proposed $380 million in new Federal support to improve the quality of math, science, and technological education in our K-12 schools and engage every child in rigorous courses that teach important analytical, technical, and problem solving skills. This initiative also expanded the Advanced Placement/International Baccalaureate Program. The AP/IB portion expanded access for low-income students to AP/IB coursework by training 70,000 additional teachers over five years to lead AP/IB math and science courses. While the country understood the importance of its new STEM focus, it quickly became a national priority because so many STEM related jobs were going unfilled across the country. As United States unemployment statistics hovered around eight percent in 2012, a close look reveals a clear contradiction. Those historically high levels never showed the types of jobs that went unfilled. Many of those unfilled jobs needed an education background in STEM (Engler). This suggests an apparent skills shortage of STEM professionals with advanced degrees. According to the Council on Foreign Relations in September 2014, “sixty (60) percent of United States employers are having difficulties finding qualified workers to fill vacancies at their companies.” The Department of Commerce estimated that “by 2018, the United States will have more than 1.2 million unfilled STEM jobs” (Bennett). In addition, “STEM occupations will grow 1.7 times faster than non-STEM occupations from 2008 – 2018” (Good Jobs and American Competitiveness). Last year, the Department of Commerce estimated that “the number of STEM jobs will grow 17 percent by 2018 versus 9.8 percent [growth] for all other fields” (Bennett). These statistics clearly show the obvious and desperate call for employees in 2012, further solidifying the concrete need for STEM to be a national priority. Today, the United State has lofty goals to pursue and accomplish. It seems as though the evolution of STEM is necessary to achieve at least one economic goal. America is crying for a shifted direction toward a “creativity economy,” in which people are a part of “imaginative processes with outcomes that are original and have value”(Pell). In order to achieve this creativity within the technological world, the conditions for creative thought must begin in the classroom. Michael Petrilli, vice president of the Fordham Foundation, a school-reform think tank, agreed with Thomas Friedman’s bestselling book in 2006, that “the economy is fundamentally different today. If our kids are going to have an opportunity to have good-paying jobs and enjoy the lifestyle they’re used to, they’re going to have to be able to use their brains. By any measure, our students are falling behind the rest of the world, especially in math and science” (Feldman). Because of these economic goals, STEM has shifted into the largest part of the basic education for students. STEM continues to act as a priority in the American education system due to the problems that persist, as well. Unfortunately, we continue to test below some international averages in mathematics. Fifteen year olds in the United States continue to turn in “flat results” in internationally standardized tests. We have barely been able to crack the global top twenty in reading, science and mathematics among students from other developed nations. In the latest Program for International Student Assessment math exam, American students missed the mark for the international average. At the same time, they scored above average on the PISA reading and science proficiency exams. According to the same article from NPR, “the math scores of students in Shanghai showed that they are “the equivalent of over two years of formal schooling ahead of those observed in Massachusetts, itself a strong-performing U.S. state” (Chappell). But, we must take this information with a grain of salt, considering the fact that “twelve provinces in China took the 2012 PISA test, the OECD confirmed, but only the results from Shanghai, Hong Kong, and Macao were publicly released. OECD “cut a special deal” with the Chinese government, allowing for “cherry-picked” results. In 2011, a Chinese website leaked the average PISA scores from 2009 for all 12 participating provinces. According to those results, China scored measurably above the United States in math and science, but significantly below the U.S. average in reading” (Heiten). Beyond this partial Chinese bias, Arne Duncan, the Secretary of Education, commented on the report and addressed the “educational stagnation” that it portrays. This stagnation shows how American STEM education has a long road ahead to set out country back on track. The shift toward STEM in the American education system has been speedy and efficient, for the most part, and this becomes evident when analyzing the large amount of success and progress, as a result of the American Competitiveness Initiative. This distinct focus on increasing students’ exposure to advanced STEM courses allowed exponential progress for the College Board and students, in general. Of the thirty-four 34 Advanced Placement courses made available to students in the United States, ten (10) of them are defined by the College Board as STEM tests. The involvement of American students in AP classes has increased from 380,000 students to 1.5 million students in just six (6) short years. The American Competitiveness Initiative also funded numerous programs for research and development. At the same time, organizations were hopping on board with STEM as companies and organizations contributed to the start of STEM programs for students, both young and old. In addition, the students in my English class are candidates for third cohort of the Pennsylvania State University Millennium Scholars Program. This program was founded to increase the diversity of researchers in science, technology, engineering and mathematics. This highly selective program is open to academically strong high school seniors whose future plans include a commitment to pursuing a doctoral degree in science or engineering. The collective goal of contributing to society through diverse, world-class research is achieved through academic excellence, sharing the knowledge amongst scholars, and using the available program resources including mentoring, tutoring and advising. The Millennium Scholars Program is directed by Starlette M. Sharp who was hired by the University to begin this program in order to change the face of scientists and engineers leaving Penn State. It becomes more evident that STEM has taken over our educational world once you take a moment to walk around a school or listen to the news. Science, technology, engineering and math are the way of our future economy, culture and world. The United States began to fall behind in STEM at the turn of the twenty first century and we should be incredibly grateful that people caught on to our shortfall sooner than later. Bennett, William J. “Hey, America, Here’s How You Spell Success: S-T-E-M.” Fox News. FOX News Network, 06 Mar. 2014. Web. 16 July 2015. Bush, George W. “President’s Letter.” American Competitiveness Initiative. White House, 2 Feb. 2006. Web. 10 July 2015. Chappell, Bill. “U.S. Students Slide In Global Ranking On Math, Reading, Science.” NPR. NPR, 3 Dec. 2013. Web. 10 July 2015. Engler, John. “STEM Education Is the Key to the U.S.’s Economic Future.” US News. U.S.News & World Report, 15 June 2012. Web. 13 July 2015. Heiten, Liana. “U.S. Achievement Stalls as Other Nations Make Gains.” Edweek.org. Education Week, 3 Dec. 2013. Web. 17 July 2015. Feldmann, Linda. “Can Bush Make America More Competitive in Math and Science?” The Christian Science Monitor. The Christian Science Monitor, 10 Feb. 2006. Web. 10 July 2015. McDermott, Tricia. “Text: 2006 State Of The Union.” CBSNews. CBS Interactive, 31 Jan. 2006. Web. 12 July 2015. Pell, Allison Gaines. “STEAM: Person, Place or Paradigm Shift?” The Huffington Post. TheHuffingtonPost.com, 1 Mar. 2015. Web. 10July 2015. This morning, our class visited the One Button Studio to present our TED Talks. It was a fantastic experience! Two of my favorite presentations that were exciting and refreshing included Oluwasanmi Victor Ariyo and David Lee. Victor had an excellent presentation on the paradigm shift of the Internet. He confidently began his TED talk and was extremely knowledgeable about his topic. Victor went in depth with his accurate sources and showed passion. He displayed interesting differences in the generations in American history between the millennials and baby boomers. David presented us with a new idea about the shift of shoes from function to fashion. It was interesting to see the actual development of companies that are household names such as Adidas and Nike. The influence of hip hop, music and celebrities on the evolution of shoes was fun. I was interested in his friend’s company of Heat Check 412 in the way that they are sharing their passion for shoes with others around Pittsburgh. There were five great moments during the experience as well. Sarea Recalde-Phillips had a very soft start to her presentation. It made the audience feel welcomed and very comfortable. It was nice to learn something new about the complexion of the tan in the United States. Victor’s pun on his last slide in his presentation about Childish Bambino was funny with the link to his music and its link to the internet. Ishan Phadke shared statistics with us that over forty percent of our nation’s first and second graders between the ages of 6 and 8 wish they were skinnier. That survey was startling to me, yet educational. Amanda Craine’s point of showing how evolution was put into action was interesting, especially in the case of Darwin’s Finches. Andrea Gade connected the selfie conversation to us and the millennial generation. I liked the way that she advocated for and encouraged us to take natural selfies without loading on the makeup and flexing our muscles. Many in America have grown to have a love-hate relationship with the lovely public education system in which the majority of our future leaders learn and grow. This relationship is the result of the faults that the system as a whole, continues to show. Our United States education system has only done what it was designed to do, over one hundred years ago when our country had different needs, in a different world economy, to satisfy a different life style using the then available technology. The American plan was to have well-rounded students to enter industry. Our students reached the potential of that system decades ago, yet the tradition style of primary and secondary education continued. The early 2000s brought a sea of concerns as televisions flashed images of Asian and Indian students, outperforming American students tremendously. President George W. Bush responded to the concerned call from numerous national education organizations in his 2006 State of the Union Address with a plan. Following the implementation of his initiatives, the United States saw a shift in education towards a focus on STEM, which can be attributed to the fear and worry of leaders, in order to be competitive with the world at large. Where are we, the United States, heading? Do we have a goal in mind? Why is STEM a national priority? Michael Petrilli, vice president of the Fordham Foundation, a school-reform think tank. American Competitiveness Initiative- What did it fund? Our culture has evolved tremendously over the past few decades and the world has changed, as we know it. Today, our World War II-era grandparents are learning to use iPads and surf the internet to connect with family and friends in our interconnected world. Today, our children are learning to read and write, months before those grandparents mastered the skill of keeping their balance. Education has also seen drastic change in the ever-changing in which we live. For my paradigm shift paper, I am interested in analyzing the development and infiltration of STEM (science, technology, engineering and math) into education and how this is changing the focus of the American public education system. While I love mathematics and hope to pursue a degree in this field at Penn State, I don’t understand why this acronym of STEM was born out of worry, just a decade ago and how it became incredibly powerful throughout that short period of time. This TED Talk was definitely both memorable and successful. It is memorable since Goffman was able to leave a lasting impact on the listener and make her point effectively. She successfully established the significance of the issue in a fast manner, with relation to the members of the audience in regards to college and coming of age. The statistics of 8% of our population being in prison as the highest in the world was alarming. Also, she makes the TED talk memorable with the personal experience that she shared from her time at the University of Pennsylvania. For African Americans and Latino…prison stands between young people trying to make it and fulfulling the American Dream. That became visible to Goffman in her experiences with Chuck and Tim. Alice Goffman manages to put the entire audience in the shoes of these young boys and their unfair, unjust system that they couldn’t break free from. Goffman leaves the audience tells the audience that while crime is down, suffering continues. Young people in both prison and college can be leaders in the work of reforming our criminal justice system. She concisely addresses every important topic that she wanted to address and didn’t over complicate anything. All of the language that she used was understandable and precise. Her rhetoric was powerful. Documenting the violations of human rights is something that should always happen. We can fight injustice with raw video. His organization, Videre, uncovers, verifies and publicizes human-rights abuses that the world needs to witness. Oren Yakobovich makes this TED talk both memorable and successful by pulling the audience in, to these awful situations and human rights violations that people live through, every single day. The videos from the tiny hidden cameras that his organization gives to people, who are daring enough to video, are incredibly powerful. The contrast of what we hear on media and what he experienced in the Israeli military were quite interesting. Companies across the globe have offered to give to the international community with cause-marketing efforts. Oftentimes, companies encourage consumers to bring in a gently used item, such as clothing or shoes, and they in turn would donate it to a cause. But, few companies have gone as far as TOMS Shoes. While traveling in Argentina in 2006, TOMS Shoes Founder Blake Mycoskie witnessed the horrifying hardships faced by millions children growing up in poverty. He quickly realized that most of them struggled to go about their daily lives without shoes. With a desire to help the children, he created his own company to make a difference in the world. He decided that TOMS Shoes would match every pair of shoes purchased with a new pair of shoes for a child in need, somewhere in the world. He began this campaign with the name of One for One. This simple idea of a way to make a difference in the world has evolved into a powerful business foundation that addresses global concerns and advances the health, education and economic opportunity across the international community. It seems as though the TOMS shoes company wants the world to incorporate the One for One campaign as something that is a part of everyday life, while manufacturing a new area where people can act as “good citizens.” People who buy products from TOMS are effectively acting as good citizens since shoes, sight, water, safe birth and bullying prevention services are provided to people in need upon every purchase. More specifically, TOMS Shoes are always given to children through humanitarian organizations who incorporate shoes into their community development programs. The company success has been unbelievable since it has given over 45 million pairs of new shoes since 2007. TOMS Eyewear launched in 2011, and has helped restore sight to over 275,000 people in need. In 13 countries, sight has been given by providing prescription glasses, medical treatment and/or sight-saving surgery with each purchase of eyewear. To incorporate cleaner water resources, the TOMS Roasting Co. launched in 2014, and has helped provide over 67,000 weeks of safe water in 6 countries. With each purchase of TOMS Roasting Co. Coffee, they work with their own Giving Partners to provide a one week supply to a person in need. Since they continually support the creation of sustainable water systems, they have managed to provide entire communities with access to safe water, which has led to improved health, increased economic productivity, job creation and access to education. In 2015, TOMS Bag Collection launched in 4 countries. With every bag purchased, TOMS helps to provide a safe birth for a mother and baby in need. Pertaining primarily to the works of Schudson, Crowley, and Hawee, the Toms advertisement calls on their audience’s civic learning, addresses a prevalent issue, and effectively uses intrinsic proofs and modes of persuasion. As we look to the text and examples presented while examining this advertisement, it becomes obvious that Toms calls upon the civic duties of its audience and addresses a prevalent issue that they need help to solve. Schudson advocated for the referencing of the audience’s learned civic duty. This Toms advertisement puts that practice into action by referencing the practices of voting and donating blood. These practices are already a part of the American way of life and many take “giving” quite seriously, as a civic engagement opportunity. There is a clear relationship between ancient and modern rhetoric that is even visible in advertisements that appear on billboards, in cities and in publications. TOMS Shoes manages to appeal to the logos, pathos and ethos of society as a whole, in a variety of ways. These methods have always been standard and effective modes of persuasion. The appeal to the pathos of everyday Americans is evident in its typeface and color. As explained in Chapter 6 of our text about the visual modes of communication, “the qualities of polished and professional are valued in our day and place,” especially when consumers are making purchases. An important visual mode is the appearance of clean cut text, which is a quality that this advertisement bestows with its rigid and clean text in a blank, black background. The creator petitions the audience’s emotions and evokes their feelings by emphasizing the phrase of “to a child in need” with the ability to reach sympathetic members of its audience, using bold print. That phrase, on the advertisement, is larger in size that anything else at the bottom. It increases the feeling of need to help protect the well-being of innocent children. Citizens feel the emotion of how it feels to help others in that every TOMS purchase supports improved health, access to education and confidence building around the world. Vision is one of the most important parts of learning and education. A large problem in our country was pointed out on the TOMS website, “Each year in the United States, two million children suffer from uncorrected refractive errors. Eighty percent of what a child learns in his or her first 12 years of life is through vision. For many students, the gift of sight means improved access to education or the ability to perform better in school.” When citizens hear about this along with the company name of TOMS, they article continue to have that appeal because of the way that the company is making such a difference even at home in the United States. Also, in Chapter 6 of our text, the relationship between pathos and color was analyzed to come to the assumption that how people respond to colors depends on the contexts in which they see the colors. The black background and white text can be seen as hard and loud to the audience. In this advertisement, there is an appeal to the audience’s logos as well. This is suggested that one can cause a large amount of good in communities, on the local and national level. At lot of this goes along with the context. For some without much knowledge about TOMS Shoes, including what was previously mentioned, there wouldn’t be as much of an appeal with logos. Also, our text analyzes the logos of arranging visual elements in the way that the author of the poster, TOMS Shoes, shaped someone else’s attention by using an actual TOMS shoe as the center of the advertisement to stress its important and what it can do for the world, persuading them to take the action. This visual composition has a limited number of elements so that the audience isn’t overwhelmed by detail and can see the point of the advertisement. The visual hierarchy is obvious with the last, valuable piece of information about making a difference at the bottom as it all makes one argument. Aristotle often wrote that ethos consists of three sub-parts that include good moral character, good sense and good will. Usually, ethos is associated with character of the speaker or writer, which in this case is TOMS Shoes. Today, Americans are persuaded by people they trust, even if the argument is not terribly strong. In this ad, the argument is strong using both the trust and commonplace aspects of the ethos of average citizens. American citizens tend to have strong ethos and Toms manages to address that well by pointing out other forms of civic duty and good citizenship. This behavior is assumed and considered to be commonplace in this great nation. 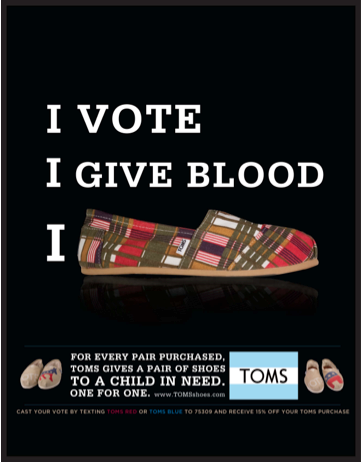 By comparing the purchase of a pair of Toms to voting and giving blood in this advertisement, they have even more appeal to the American people because those acts have been and always will be important parts of our American identity and ideology.